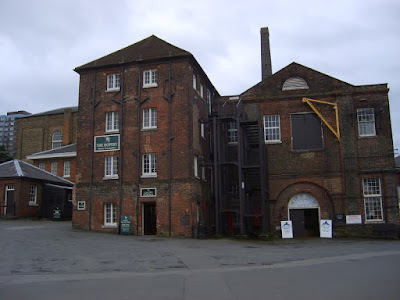 I am honoured to have been invited to write a post for your blog, and as I lived not a stone's throw from Chatham Historic Dockyard until very recently, I thought I would give you a virtual tour through the best preserved Georgian Dockyard in the world. 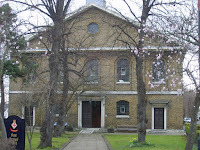 I do not have photos of every building of interest, unfortunately, but I am very happy to share what I do have. The first picture is of the Dockyard in the middle of the eighteenth century and was painted by Joseph Farrington, who never visited the area. However, it is perfectly accurate, although the surrounding area has changed almost beyond recognition. 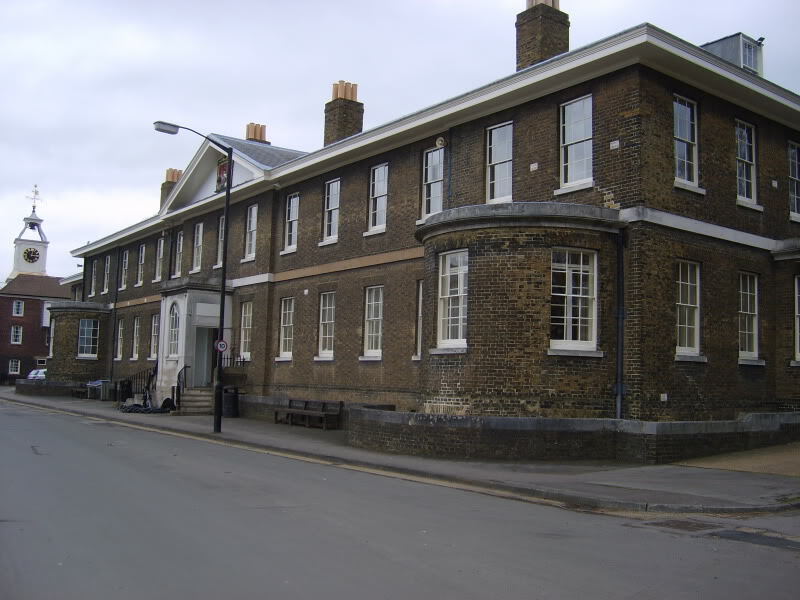 Chatham Dockyard is situated on the River Medway, about ten miles or so from the sea. 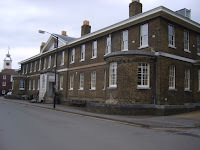 It is the easternmost of the three main dockyards (Chatham, Portsmouth and Plymouth) and its situation meant that it was of most importance during the wars with the Netherlands in the 17th century. When the wars with France began, the dockyards further west gained in importance, and Chatham became the primary ship-building yard. HMS Victory was launched here in 1765 and HMS Temeraire in 1798, just two of many ships that found fame at Trafalgar and other battles. 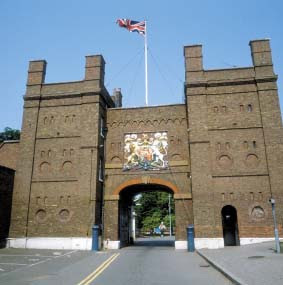 A visitor coming from London would first see the magnificent brick-built gate with the Royal coat-of-arms, which would have been guarded by two Royal Marines in their smart red coats and round hats. 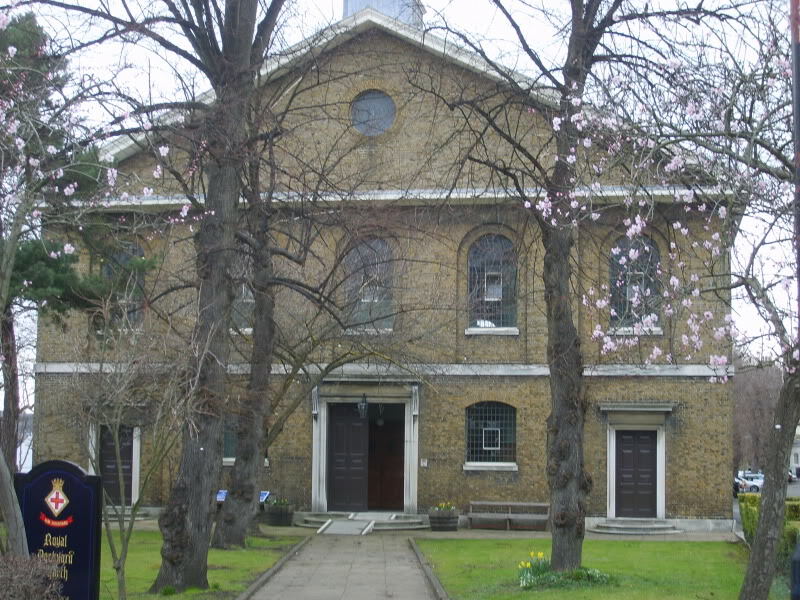 During the Napoleonic Wars (and the War of 1812), this would have been the main entrance to the dockyard, and so we will begin our tour here. 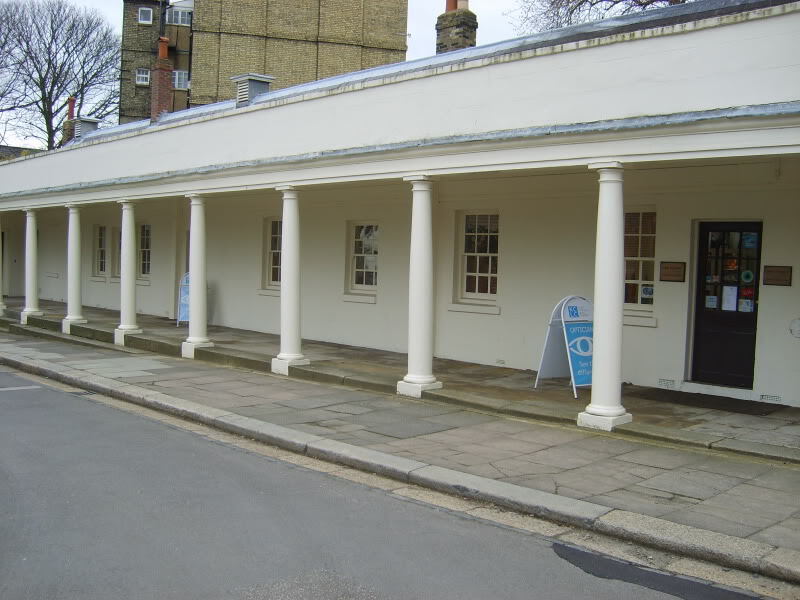 You will pass the guardhouse on your right, with its white-painted columns, and the Dockyard church (built in 1812) will be in front of you. 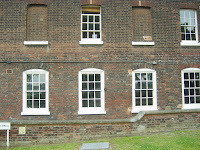 As you continue down the main road, the crew's quarters building is on your right, and if you turn left to head towards the river, you will pass the end of the Ropery – all the rope is spun by hand and is marked with a coloured thread called the rogue's yarn (Chatham rope has a yellow yarn). This is both to prevent theft from a Royal dockyard and so that substandard rope can be traced to its place of manufacture. The Ropery is half a mile lone, which allows a standard anchor cable to be spun (as rope is spun, it decreases in length; a half mile building will produce a two-feet thick cable that is 72 fathoms long). Rope is still made here to this day, although the workers now make use of the machinery that was installed during the Victorian era. On the river side of the Ropery are three massive storehouses, which were used to store all the equipment necessary for fitting out a ship, from hammocks to hogsheads of beer. When a ship was paid off, her movable stores would be likewise brought here. 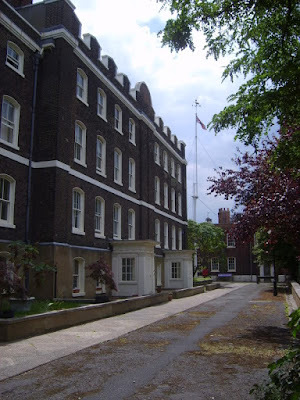 Thee photo is from outside the Dockyard, from the site of the old Royal Marine barracks, but it gives some idea of the scale of these three buildings. 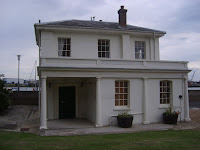 If you continue along the riverside away from the Ropery, you will come to the little white Harbour Master's House, with the imposing edifice of the Commissioner's House behind it. 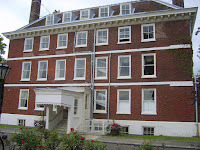 The Commissioner's House is the oldest building in the modern Dockyard and was completed during the reign of Queen Anne, right at the beginning of the 18th century. 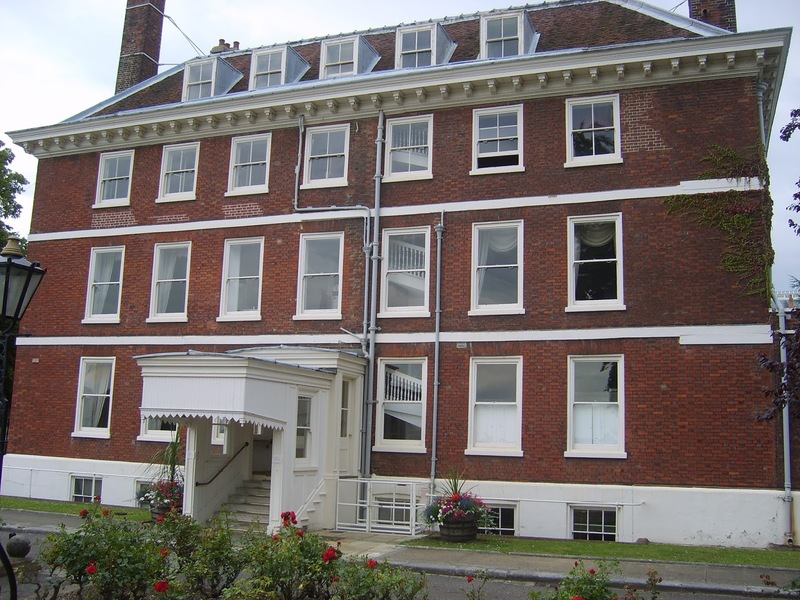 A little further on from the Commissioner's House is the Admiralty Office building, with the Clock Tower building beside it. These both have a low profile because the Officer's Terrace is behind them and thus has an uninterrupted view of the dry docks and the river. Continuing on, you will pass the smithy (which again I do not have a photo of) across what is now a large open gravelled area, but that would have been used for seasoning wood in huge stacks. 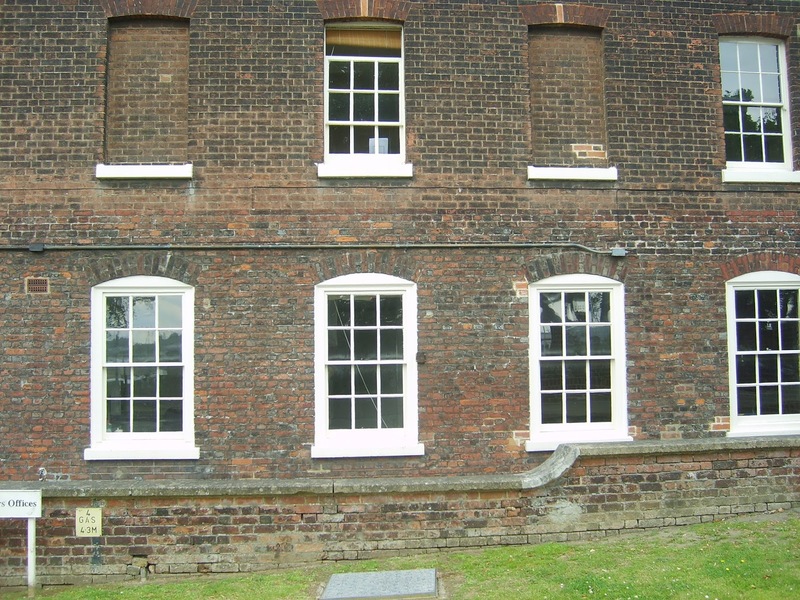 The white-painted building with the asymmetrical roof-line is the mast-house and mould loft, and is where the masts would have been made (on the lower floor) and the templates for the ship's ribs would have been made on the upper floor. 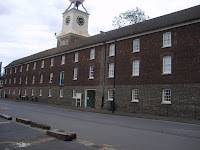 To the right of this building as you face it are the capstan makers' and wheelwrights and tucked away are the timber sheds, which again were used to hold timber that was being seasoned for ship-building. 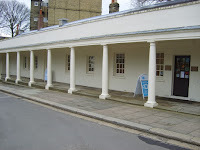 As the mast house houses the modern visitor's entrance and gift-shop and there is a tea-room in the Wheelwright's workshop, this seems a good place to end our virtual tour. Special thanks again to guest writer Keri Tolhurst (aka 'Sharpie')! Really pleased you liked it! Excellent work, Sharpie! This is so interesting. I'm so lucky my parents live near there - it's one of my favourite places in the world to visit! Really glad you liked it!